I really hope this doesn’t turn into one of those patronising “If I only knew then what I know now” type missives. If it does, I’m sorry. But recently I’ve taken to remembering what life was like five years ago, and I wanted to encourage you for all you’re doing. You’re about to turn 30. You have a 1-year-old boy and have just found out you’re expecting again. I want to tell you that the jump from one to two children will not be that bad. You think it will – but I promise you, it won’t. You undersell yourself – but really, you’ve developed so many new skills since becoming a parent that you’ll cope with the new arrival – as well as your lively toddler – with your eyes closed. I’m not saying it won’t be hard – just that you’ll be fine. You’ll learn how to feed two, get in and out of the car with two and navigate swimming lessons with two. Soon, you’ll be able to assemble the double buggy in seconds, entertain your 2-year-old while you feed your newborn, and somehow find time to load the dishwasher. (Good purchase, by the way. It’s only been a few weeks, but this will turn out to be The Best Decision you ever made. Nice one.) You are no longer the anxious first-time parent who didn’t know how to change a nappy: you are assured and confident – even if you may not feel like it all the time. One day, you’ll have more kids, and you’ll realise that it was glorious, glorious to have as many parents as you had children. But that’s for another time. Don’t think about that right now. I want to tell you that, five years on, the parenting parameters have changed. I guess you remember the hell of All The Comparisons at baby groups – you know: which kid sat up first, crawled first, walked first, said the first word. Having crossed over from preschool to school territory, do you know what actually counts? That your son is kind and considerate. That he can make friends. That he’s a nice person to have around. And guess what? All the kids in your little boy’s class can stand, walk and talk. No big deal. They all got there. Keep reading and singing – don’t forget the singing, just because he’s too big to sit demurely in his baby bouncer while you play the piano to him. Sing whenever and wherever you can, accompanied or not. Most of the time it will be not – but that doesn’t matter. They’ll tell you that all this is good for reading later on. 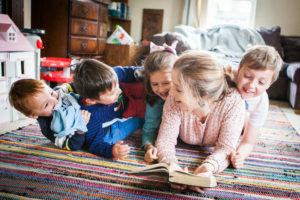 You’ll nod your head but you won’t understand – until the time when he actually starts learning to read and you realise that it’s all about rhythms and rhymes, the fall and rise of speech and song – and that a wide vocabulary doesn’t hurt either. I realise he can only really say ‘duck’, ‘cricket’ and ‘chocolate’ right now, but he’s taking in every word that you speak or sing to him. There are a lot of nappies and a lot of washing. Sorry about that. One day you’ll have twins and they’ll poo eight times a day and you’ll remember these days as a doddle. You’re great at keeping busy. So many groups, so many playdates. You know what? Your little boy is learning, even now, the important skills of sharing, taking turns, relating to other kids, being hospitable, paying attention, trying things out, responding to adults. Keep up the socialising – it will pay off. But the small fortune you’re forking out for swimming lessons – that will not pay off. At least it hasn’t done yet. Honestly, utilise the free toddler groups at churches and children’s centres – he’ll get just as much from them. You know the friends you’ve made in the last year? Some of them will turn out to be some of your best friends. You’ll share highs and lows together and, before you know it, the friendship will be deeply dug, strongly built, firmly cemented. There are one or two more special friends to come as well – you might not recognise that spark when you first meet them, but circumstance will bring you together more and more, until eventually your bond is stronger than iron. Oh yeah, the adoption thing. It’s going to happen – but don’t worry, God’s going to get you excited about it in His own time. I know right now it feels like the scariest thing in the world – if it feels like anything, because you’ve been pushing it so far back in your mind, it hardly even exists as a concept. But the seed is there, and it’s going to grow. Finally: I know he’s clingy. I know he won’t leave your side unless Dad’s around. I know he screams and screams and screams when you leave him once a week – at home – for an hour’s Bible study retreat with friends. I know you can’t understand why he doesn’t realise you’re coming back, why he’s uncomfortable with those he sees regularly, why he doesn’t just get on and play like the other kids. Guess what? I still don’t understand these things – and never will. And the boy would just laugh if I told him now. But keep doing what you’re doing. He will gain his independence from never having had you turn away his dependence. When he eventually learns to separate from you, he will do it with such confidence. Keep going, Mama. Enjoy these days, they go so fast – but the best is (always) yet to come. How beautiful! Also an interesting way of demonstrating the kind of voice we mums could try using when addressing ourselves in our heads – a kind voice which is not at all self-flagellating. Yes, lots of diversion to be had by telling your five/six-year-old child what they were like at the age of one or two!